The technique Acogny is the only recognized contemporary dance technique created in Africa. It was created by Germaine Acogny, the mother of African contemporary dance. Based on traditional African dance (especially Senegal and Benin) and Western dance techniques (classical ballet, release, and Graham technique), the philosophy of this technique is about identity: placing yourself inside the community and nature, and being aware of your own body. The technique respects every different body, and addresses life and the connection between human being and nature. Joy, play, love and music are the fundaments of the spirit of the technique. Mekbul Jemal Tahir is an international choreographer, dancer, and teacher. He is one of the founding members of Adugna Community Dance Theatre Company, which is based in Addis Ababa, Ethiopia. 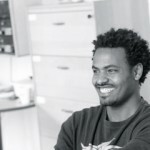 Since completing a five-year training program accredited by Middlesex University (UK) in 2001, he has been performing and teaching African contemporary dance, contact improvisation, and community dance and theatre in Ethiopia and abroad. Among others, his projects have included the 2005 Kin-Addis Project in the DRC, Ethiopia, and France, and the 2006 Can Do Can Dance Project in Hamburg, Germany. In 2007, he performed a lead role in As the Mother of a Brown Boy, which opened at Chickenshed Theatre Company in London and later traveled to the Edinburgh Fringe Festival, where it was nominated for two awards. He is also one of the dancers who were selected to study Germaine Acogny’s dance and certified to teach her technique. 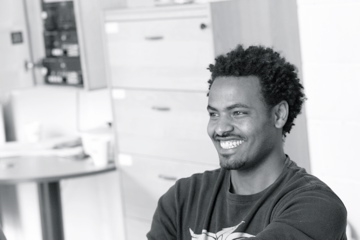 Now a resident of Massachusetts, he divides his time between work with Adugna in Ethiopia and projects in Africa, Europe, and the United States.